Unless it's a phone interview, most writing assignments start out the same old way: planes, trains, and automobiles. You get the gig, you hit the road, and you get the job done, be it at a hotel or on a movie set or in some foreign country. Not so with Tommy Lee Jones. By the time I arrived at his West Texas ranch, I had flown across both of Texas's time zones, driven another couple hundred miles, and ended up on a dusty ranch road following an intricate series of rights and lefts, crossing cattle guards and looking for tell-tale railroad ties. And the best part? The welcome wagon that greeted me. I was less than a mile away from the WD's headquarters when off in the distance I heard some hollering. I cut the engine, got out of the car, and the next sound I picked out was the pounding of horses' hooves. Surrounded by low hills, I couldn't see anyone, but could I hear those cowboys coming. A cloud of dust soon cloaked the sky. I drove out on to a flat, and there, not 100 yards off, my host and his men had reined in their horses and gone from a gallop to a walk as they made their way back to the barn. That first week of May 2000, I spent three memorable days at the WD. 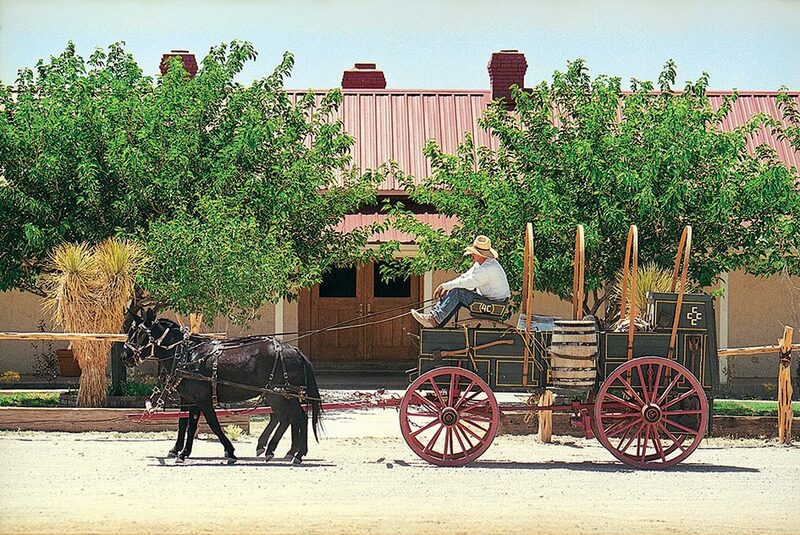 This story, which first ran in Cowboys & Indians, chronicles the better part of my stay. It's the type of terrain that most people only know from the moviesrugged mountains rising up off enormous ranches where cattle, a few cowboys, and an occasional dust devil are all that exist with the exception of what the good Lord saw fit to put there. 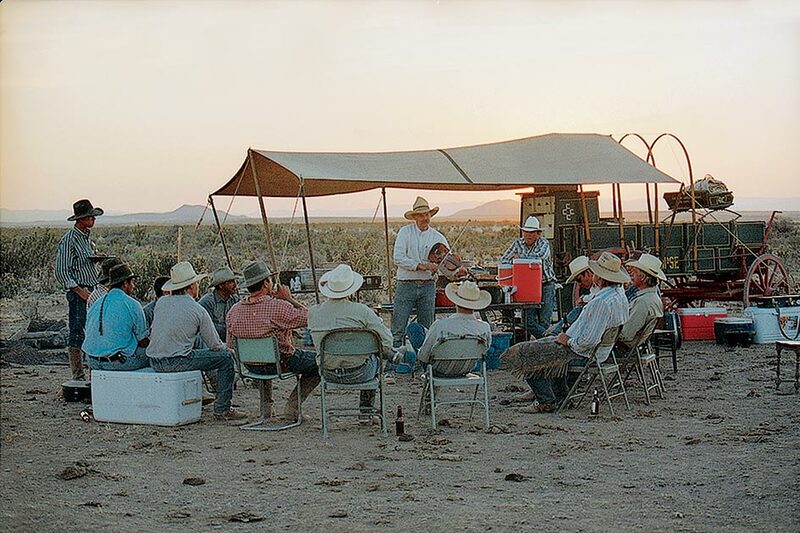 In this stretch of West Texas people and towns are few and far between, but many a Western has been filmed out here, and this morning's gathering seems scripted from Giant, Lonesome Dove, or maybe The Good Old Boys. Cowboys mill around the campfire. Cattle bellow in the dark. A camp cook shovels coals on top of a Dutch oven. Make no mistakejust because one of Hollywood's biggest names is about to pull up in a pickup truck, this is no movie set. These men are not actors. It's spring roundup on the WD, and since the days of the Apache, the WD has been a working ranch, owned and operated by men like W.D. Reynolds, who stocked it with hardy cattle, ran it with a tight fist, and kept a close eye on their herds, their waters, and their country. And now that Tommy Lee Jones is running this ranch, odds are things won't be changing any time soon. They are without question a most unlikely band of brotherssome Argentines, a Uruguayan, a couple of mexicanos, and half a dozen Texans. Not that you can tell them apart at this hour of the morning. Even though they've all been up since five, it's still another hour till daybreak. 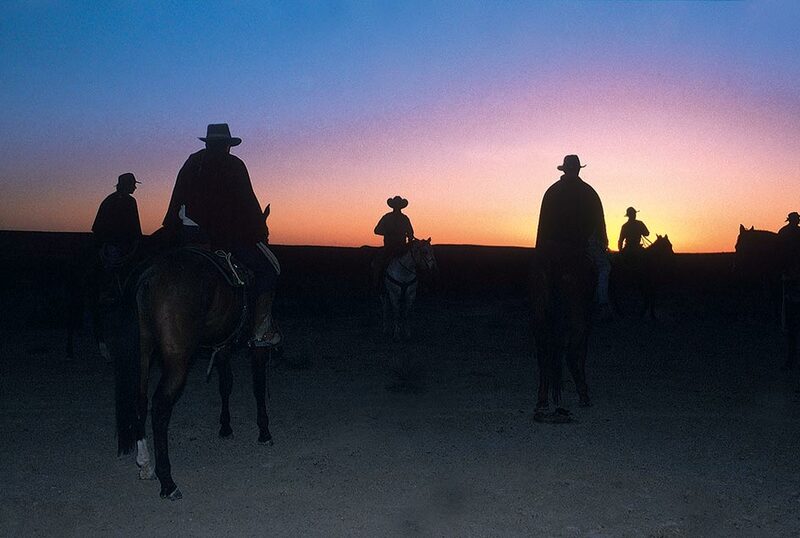 By then, as they make their way across the Fence Post Pasture on horseback, each will be easy to pick outthe gaucho by his felt chambergo (hat) and poncho (cape), the vaquero with his straw sombrero and pitiado belt, and the cowboys, their well-worn chaps and hand-tooled boots covered in dust. Right now they're all parked under the fly of a mule-driven chuck wagon, warming their hands over the campfire or with a cup of hot black coffee. There's a good bed of coals goingthe cooks have been up since fourand the glow is just bright enough so you can see the steam rising off some fresh-baked biscuits and a pile of fried bacon. The first light of day comes when some headlights approach the camp. Everyone knows it's Tommy Lee Jones. This is his ranch, and he's running roundup so when the man says breakfast is at six a.m. he holds the entire outfit, including himself, to that schedule. I know for a fact he steps out of that pickup clean-shaven and ready to ride, and if there were a time clock on that chuck wagon he'd have punched in at 5:59:59. Even though he's just a shadow in the dark, the sound of his spurs makes right for the wagon. What happens next seems like an outtake from The Fugitive. "What's everyone standing around for?" Jones asks. "Looks to me like breakfast is ready, and as best I can recall we've got some cattle to work, gentlemen. Let's dig in." It's the sort of take charge attitude that no one does better than Tommy Lee Jonesdirect, driven, uncompromising, and unapologetic. Shadowing Jones on this day at the WD, on horseback, in his office, around the burn box during branding, it becomes apparent that the native Texan is as much a character off screen as on. Like many of his acting roles, the most illuminating aspects to the man are the sides rarely seen. Consider him in The Fugitive where his character, Deputy U.S. Marshal Samuel Gerard, relentlessly hunts down Dr. Richard Kimble. What makes the movie (and probably won Jones an Academy Award) is when Gerard stuns Harrison Ford's character by uncuffing him in the film's final scene and handing him an ice pack. "I thought you didn't care," Kimble says. "I don't," grins Gerard. "Don't tell anybody, OK?" Just like Gerard, Jones is not in any hurry to reveal this caring side. He's not ashamed of it, and he doesn't hide it. It's this contradictory part to his personality that makes him so fascinating on the setand on the ranch. For the last four days, Jones and his crew have worked from dawn to dusk on the WD, riding horseback through pastures with rough cut names like the Jake and the Deep Well, driving herds of Brangus cattle into pens where hundreds of calves get branded. Yet a couple of weeks before roundup begins, when we speak about this interview, it's not the cattle on the WD that concerns Jones. He cuts our conversation short because his top priority is an Easter Egg hunt that he and his girlfriend, Dawn, are organizing for his daughter, Victoria, and the kids off the neighboring ranches. It may not be his most familiar role, but to Victoria, 9, and his son Austin, 17, he's the caring parent who puts Hollywood and journalists on hold. But now roundup is in full swing. About 100 cows and calves off the Fence Post Pasture were worked this morning, and when the crew gathers for lunch at the chuck wagon, cold water and iced tea are in high demand. While everyone else talks, Jones sits off to the side, looking over the morning's numbers. It's as if he has a good script in his hands, and no one disturbs him. Jones and George Kidd, his ranch vet, will spend a good half hour reviewing roundup totals in the WD's spartan ranch office, where Jones's idea of decorative art leans towards topographic maps and water well charts, not Remingtons and Russells. He sits behind a simple pine desk and pays no attention to today's pile of faxes from head honchos in the media and entertainment world. In four days he'll be off for Cannes to the overseas release of Rules of Engagement, but right now idex-clad starlets and buzzing paparazzi aren't on his mind. What matters most to Jones is his ranch numbers, not his box office numbers. "The average weaning weight of a calf off the WD last year was better than 700 pounds. That's really ringing a bell on the west side of the Pecos River," Jones says, clearly proud of his off-screen performance. It's ironic that in an industry where actors have to "learn" to play cowboy, Jones doesn't have to. He's been ranching for 20 years; he's got cowboy in his blood. One of his most cherished possessions is a bit he uses that belonged to his grandfather, Archie Lee Scott. It dates back to 1919. 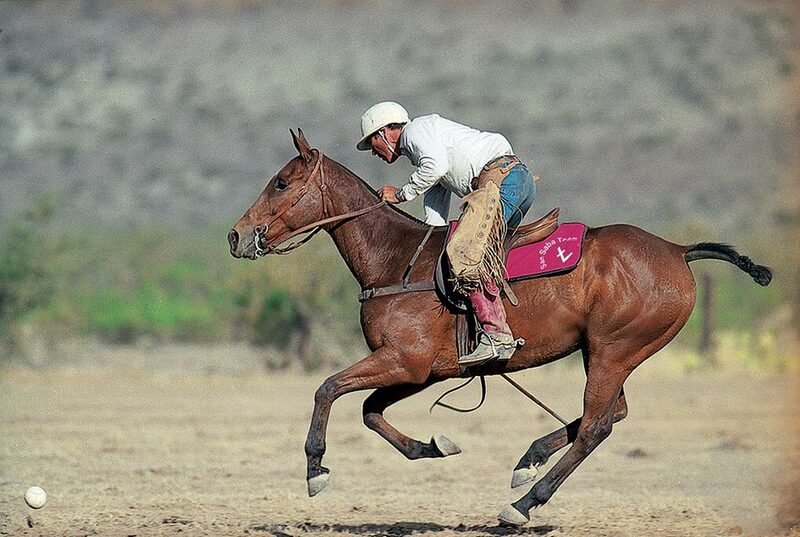 "Granddaddy rode remounts for the cavalry. Worked for Len Mertz. One year he broke 200 horses. He was an awful good cowboy," he says. It was only natural that Jones was cast as Hawk Hawkins in what will certainly be one of this summer's biggest blockbusters, Space Cowboys. A Texas cowboy, Hawkins is recruited to join a group of ex-Air Force pilots whose mission is to salvage a malfunctioning satellite. Together with his crewmates, played by Clint Eastwood (who also directs), Jim Garner, and Donald Sutherland, they team up in outer space, bend and break a healthy number of rules and regulations, and of course, save the day. "Let me tell you how they broke me in," he says. "First day I drove out to the set, said hello to Clint, got costumed, and went to makeup. When I was all ready, Clint asked me, 'Are you afraid of flying?' And when I told him I wasn't he pointed to an old Army biplane and said, 'Hop in.' It was a Stearman, and I thought we were just going to shoot a scene without even taking off. Next thing you know we're doing barrel rolls and loop the loops. We flew those canyons so close that afterwards when I asked the pilot about my parachute, he told me, 'We were so low it wouldn't have worked anyway.'" Jones stays humble as he talks about what it was like to work with the best in the business. "I feel pretty lucky," he says. "Those guys, they know my name. They know who I am. Not bad for a little Indian boy. Not bad." I ask him his tribe and am quickly corrected about his grandmother's heritage. "It's not a tribe. It's a nation," he says. "The Cherokee Nation." Jones is keenly aware of the fickle nature of fame and fortune. Despite his many successes, he knows he's been lucky, and he has a unique way of reminding himself of his good fortune: his brand. An upside down seven with a hash mark through the middle, he calls it the Siete Loco (a iish term meaning "crazy seven"). "I use that brand because it sure took some crazy luck for me to own this place," he says, referring to the WD. "When I look at my career and think about how I got to where I am today and the way it's all turned out, the Siete Loco pretty much says it all." This crazy luck of Jones's, coupled with his considerable talents and tenacious drive, has resulted in a life filled with an amazing series of accomplishments and events, people, and places. As a teenager growing up in West Texas, he won a scholarship to prestigious St. Mark's School in Dallas where he first made a name for himself, playing football. He went on to earn a scholarship to Harvard, won All-East honors as an offensive lineman his senior year, and was in the trenches during one of the most famous gridiron battles in college history: Harvard's 29-29 "win" over Yale. Not only did the tie preserve the Crimson's first undefeated season since 1920, but Harvard's 16 points in the final 42 seconds are now the stuff of Ivy League legend. For the record, he is protectively unforthcoming about his college roommate, Vice President Al Gore, or their close friendship, which the two steadfastly maintain. 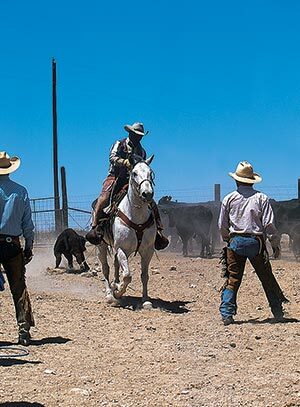 By the time we finish our two-hour chat and I leave the ranch office of the WD, it's clear that no matter what talents the man has been given, he's applied them to the fullestin his schooling, on the gridiron, as an actor, and with his ranches. It's an ethic common to any cowboy worth his salt, and Jones applies it not only to his work, but also to his play. And when it comes time for Jones to play, he plays polo. Yet in his typical manner, Jones defies expectations and doesn't come to polo in dress whites and a pique shirt. He may play against royals and captains of industry, but he runs his polo operation, 50 horses and a team of players, as firmly as his ranch. Jones learned polo the cowboy way, and he keeps a close eye on expenses while working with different corporate sponsors to offset costs. He firmly believes that cowboysand gauchos and vaquerosembody the best aspects of the game of kings. Although it may come across like another brag from a boastful Texan, those who know the sport acknowledge that the greatest polo player who ever lived was a Texas cowboy by the name of Cecil Smith. As luck would have it, Smith grew up a little over 30 miles from Jones's hometown of San Saba, and Jones was fortunate enough to become a close friend of Smith's, going so far as to host ranch polo matches and family barbecues for Cecil and Mary Smith, their family, and friends. Today's match is not only a first for the WD, it marks the return of ranch polo to the Big Bend country. No doubt the great 10-goaler would have been proud of Jones, whose new field has no grandstands, no announcers, and a gallery consisting of a couple of jack mules, a horned toad, and some well-hidden varmints. There's no grass either. Jones respects his neighbors too much to waste a well watering a polo field during this drouthy time. His polo pitch is a skin field, scraped clear of cactus and catclaw and playable only by talented horsemen with sure-footed mounts more accustomed to hard scrabble than well-watered bent grass. When Jones swings into the saddle, he's ready to play the sort of polo Cecil Smith knew best. He's on board Academic, a home bred gelding off of his San Saba ranch that worked cattle all morning long. Jones is wearing his work clothesa long sleeve shirt, some Wranglers, his chinks, a pair of custom boots from Rusty Franklin's in San Angelo, and the gal leg spurs he commissioned for the role of Hewey Calloway in The Good Old Boys. Palm Beach this is not. Instead it's a duel in the desert as working cowboys and professional polo players raise a cloud of dust so thick that play sometimes stops to allow the fine dirt to settle and the ball to become visible once again. Jones is in the middle of it allhe's an accomplished player and carries a 2-goal ratingbut there are plenty of times when no one can be picked out of the raucous group of stampeding Bedouins. There's a sense of celebration once the three-team round robin concludes. The Fence Post Pasture edged out the Horse Camp and the Javelina for top honors, and they line up first at the chuck wagon for a hearty dinner of fried steak and potatoes. Spring roundup is ready to wrap up, and no one seems to mind that it's been a long hard day. Luis Echezzerata goads his brother Laureano in to getting out his guitar, and the native Argentine starts playing song after songa sad milonga from the pampas, one from Colombia, another from Brazil. When Laureano breaks into a lively chacarera, his older brother jumps out into the middle of our circle of chairs and cuts loose with a cross between a Russian saber dance and "The Cotton-Eyed Joe." 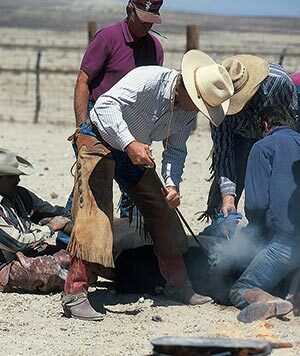 Luis sits down to a round of applause, and Glenn Moreland, the camp cook, steps out from behind the chuck wagon with a fiddle under his arm. 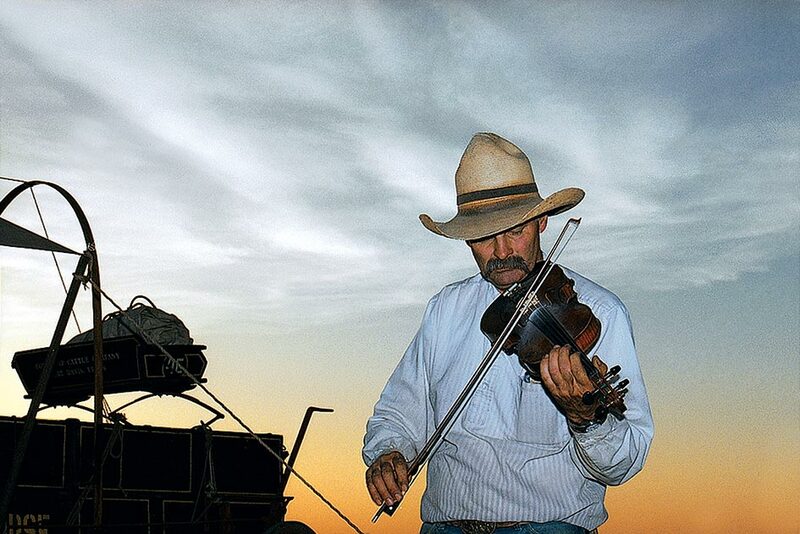 As he plays a few cowboy favorites"Old Paint Waltz" and "Ragtime Annie"the soothing sounds of his fiddle seem to still the night. Behind the fiddle player, on the horizon, the sun is soon to set over the Sierra Vieja and the Wild Horse Mountains. It's the perfect backdrop for the day's final scene. As Glenn begins to play "Faded Love," the Bob Wills classic is positively mesmerizing. No one says a word or makes a move. No one that is, except Tommy Lee, who stands up after a few notes and offers his hand to his girl, Dawn. The two met on the set of The Good Old Boys, a TNT movie that Jones starred in and directed, and have been together ever since. As if on cue, the sky lights up in an explosion of orange and amber and indigo and magenta. And, as the lonely fiddle echoes out across the WD, a rough and ready cowboy tenderly leads his partner around the dirt dance floor. It's just like a movie. Only better. P.S. The cowboy and his sweetheart dancing in the dust? They got married the following year.